Lady Rosenstiel Polish Play: "Bonsoir Monsieur Chopin"
Thursday, Nov. 10th, 2016 | 7:00 p.m. 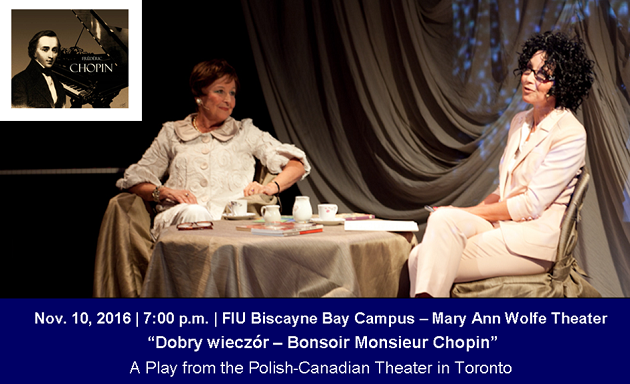 The European Student Association at FIU, in collaboration with The American Institute of Polish Culture, The Honorary Consulate of the Republic of Poland, and the European & Eurasian Studies Program at FIU, is pleased to invite you to a play about the life of Frédéric François Chopin, an extraordinary Polish composer and virtuoso pianist. Presented and Co-sponsored by the European Student Association, the American Institute of Polish Culture, the Honorary Consulate of the Republic of Poland, Chopin Foundation of the US, the European & Eurasian Studies Program, FIU Department of Theater, the Miami-Florida Jean Monnet Center of Excellence.